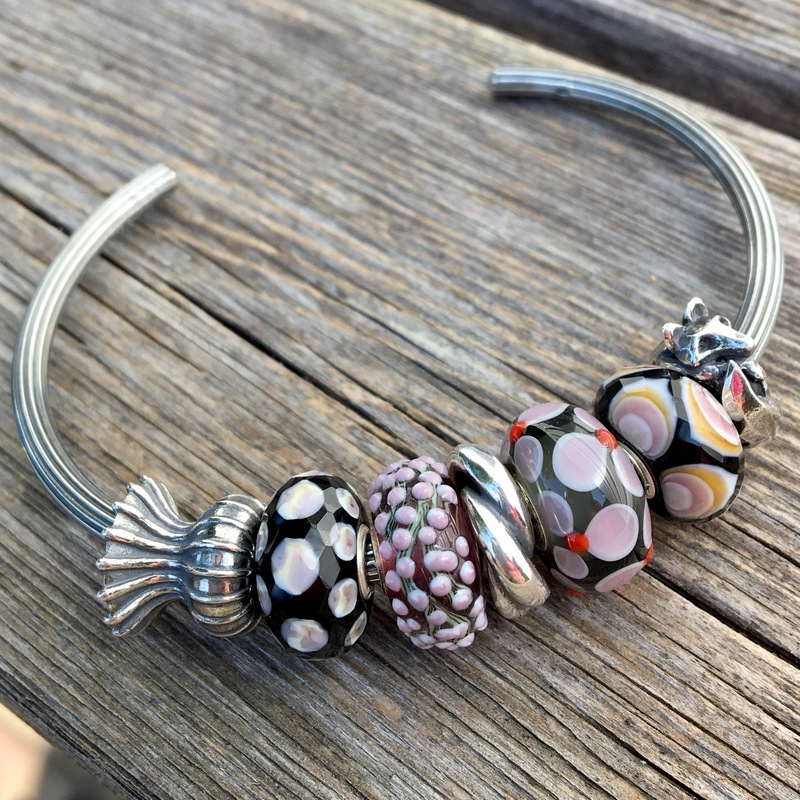 The Blooming Boutique store in Delaware always has an incredible selection of Uniques on their online parties, with photos of the front and back of beads. 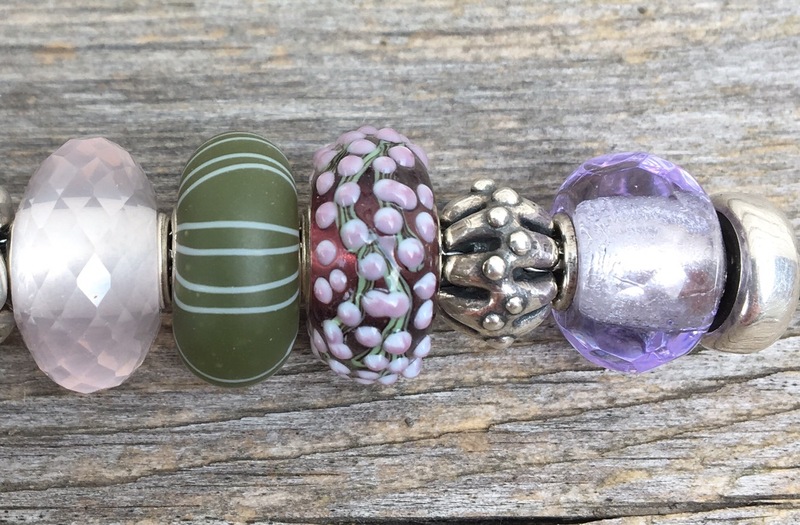 They post live images of regular beads, too, which will come in handy for the glass in the fall collection, especially the Forest Mist bead. Also, their Uniques are Buy 5 get 1 free. I picked three lovely ones and made up some combos with them for today. On this bangle below, the Uniques from the store are at numbers 2, 4 and 5, going left to right. I choose them partly because I thought they might go with the Unique I bought in Michigan and they do! The pink one in the middle is a Universal Unique (ie., larger core) that came with my leather bracelet. The style for number 5, with all the little bumps, makes me think of the inside of a flower for some reason. I love the delicate thin green lines. I think the one with the little bumps looks sweet with a couple of Lavender Prisms. Here, the upcoming Shape of Magic bead is in the middle and then I added two Rose Quartzes. The teeny splash of a bright orangish hue made me think of Golden Cave, which is in the middle of this bracelet. Below you can see what I’m talking about if you look at the Unique to the left of the Golden Cave below. See the tiny bit in the middle of the flowers? That little touch of colour is so striking and I never would have thought of it matching, but I think it’s just gorgeous! 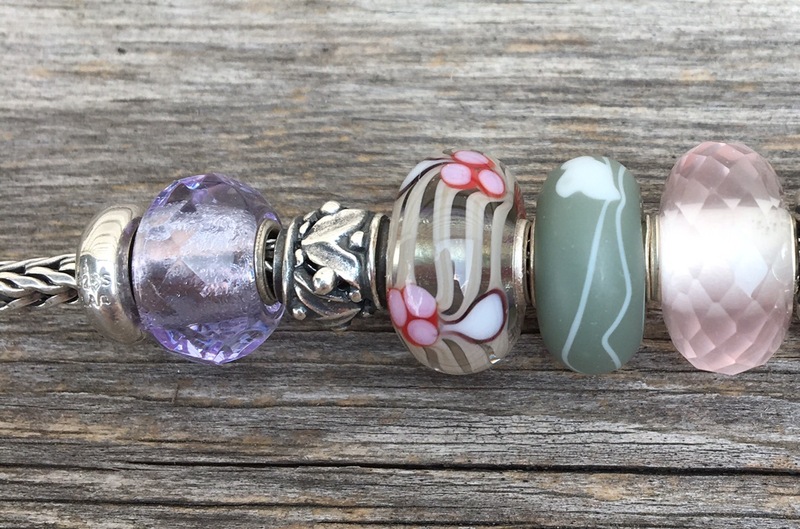 Below left to right are a Lavender Prism, Rhythm Drum, a Unique, a bead from the Kimono Kit and Rose Quartz. Below left to right after the Rose Quartz are Water Lily Family, a Unique, Golden Cave, a Unique, Moonlight Dancing and Rose Quartz. Below left to right after the Rose Quartz are a bead from the Kimono Kit, a Unique, Pumpkin Ornament and a Lavender Prism. Blooming Boutique tends to group Uniques by colour, which is how I discovered these three. You can see a recent online party here. I went back into mid-July to find these beads and it’s fun to look around. These beads are a super addition to my collection! Edited to add this photo-wow! Coming up later this week will be a blog post on the upcoming Forest Secrets Kit. Click on my Instagram or Facebook links to see a couple of pictures. Also this week will be a Newfoundland inspired travel post featuring Vikings from Perlen. 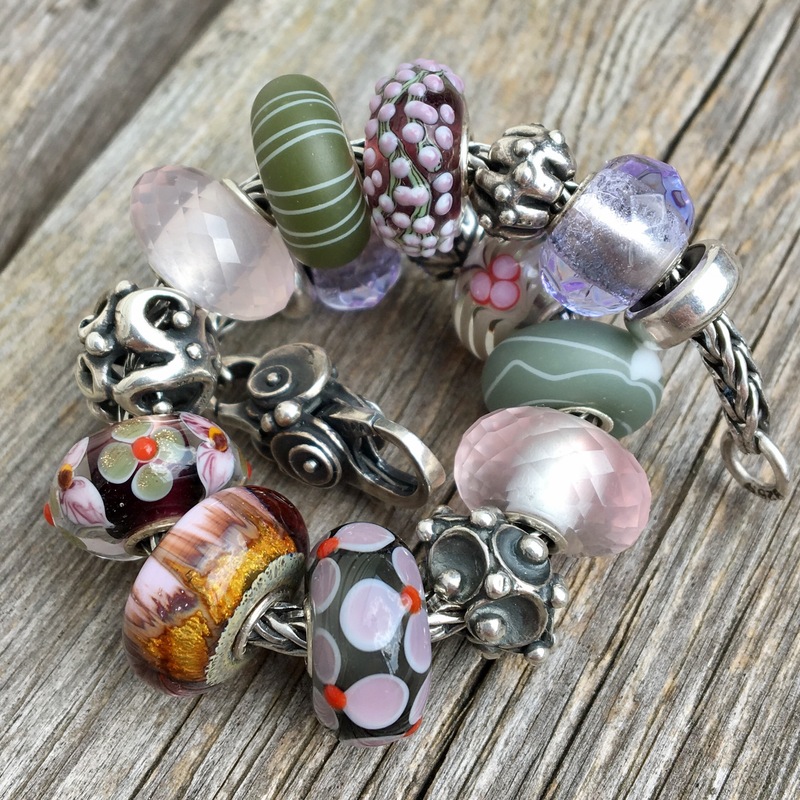 Very pretty beads, and your bracelet is beautiful! I love the Gold Cave in the center – it gives a little extra richness to the soft, romantic palette of the other beads. I used to be rather addicted to unique hunting, but eventually gave up on it because it got to be too stressful to try to find the ones I really wanted. But I did recently buy a couple of jumbo uniques, and had fun browsing the site and looking at all the different designs! It’s definitely fun to look to see what’s out there. I think my friend Sarah said she looks on their site almost every day! I keep seeing incredible Azure Bubble too, with lots of purple and cream colours and have to try hard to resist buying more! Hope you’re enjoying your jumbos! I have two and really like them as a focal point. Ah, what a great selection! I’ve always shied away from uniques because I found them so hard to pick out and pair. I like the way Blooming Boutiques groups them and will have to try one! A coordinating set really makes a bracelet! 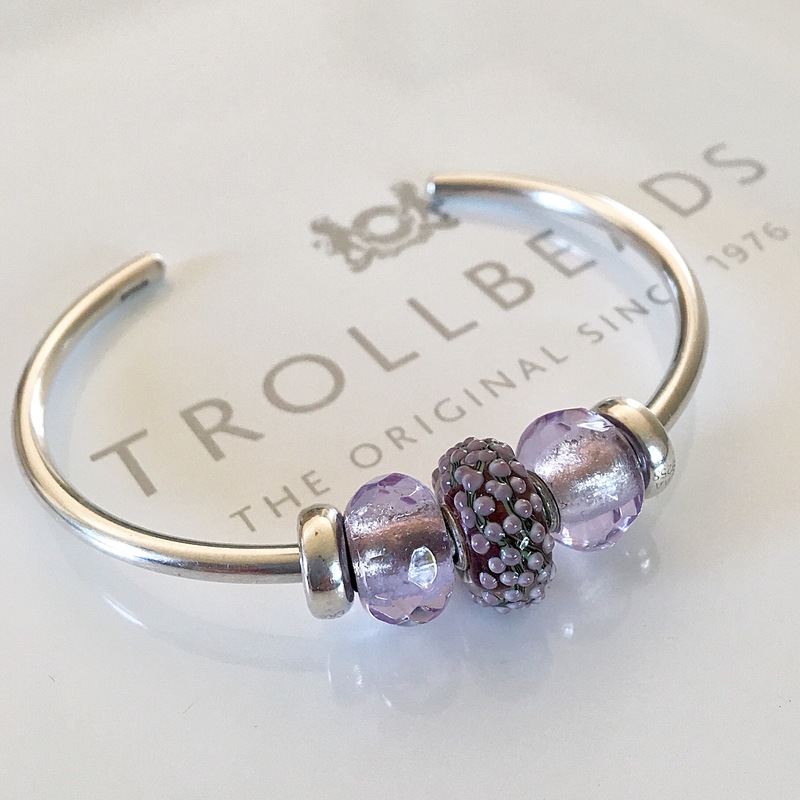 I especially like the “bumpy” ones-they had a few of these in orange with what looked like vines last year at Trollbeads Gallery. Now I wish I had taken the plunge! Tanya, I totally agree that a coordinating set makes a bracelet. I could have spent hours making different combos but that wouldn’t have been very responsible of me-go away kids, I’m playing! 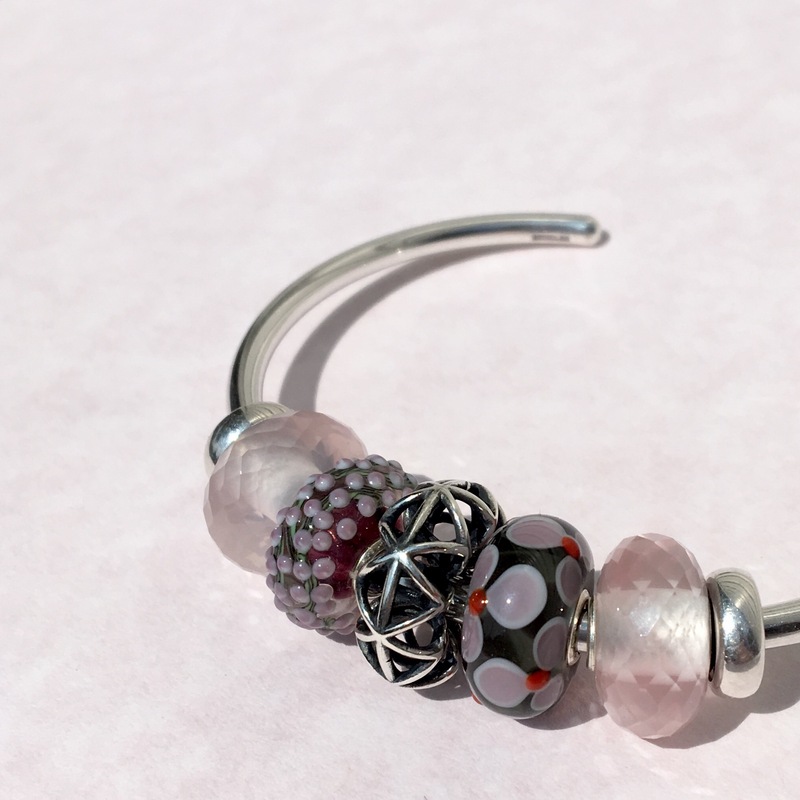 Even with a pair of matching Uniques, by adding one bead you already have and a couple of silvers, there’s a whole new look for a bangle! Hi Martha, When you first showed the Unique that you bought in Michigan it was “love at first sight” for me. You had mentioned that you got it despite not being sure what you were going to do with it. If I find that bead somewhere I’m getting it… If there is another one like it. I have no idea what I would do with it either, but that’s okay. I’m so bad with color I doubt that I could pick ones that match from photos even if they were live. It really amazes me that you found one with the little bit of color to go with Golden Cave. So far I have one Unique ( purple bird bought because of you!) I at least need a few more birds to add to the flock. Hi Suzanne! A flock of birds sounds delightful. Imagine a bracelet of nothing but them! The funny thing about the Golden Cave is that I haven’t used it very much but I just adore it with these Uniques. 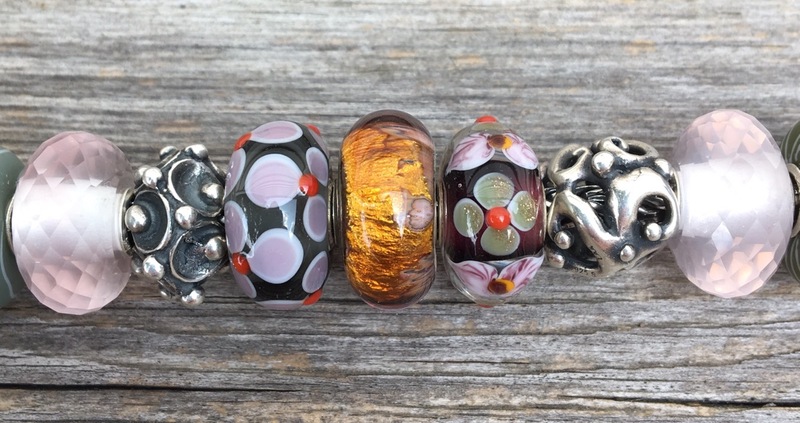 I was also guessing that these ones would go with the new Trollbeads and oh my goodness, they do. I’ll take a photo now and add it. It looks great, Martha!!! And I LOVE the bangle. 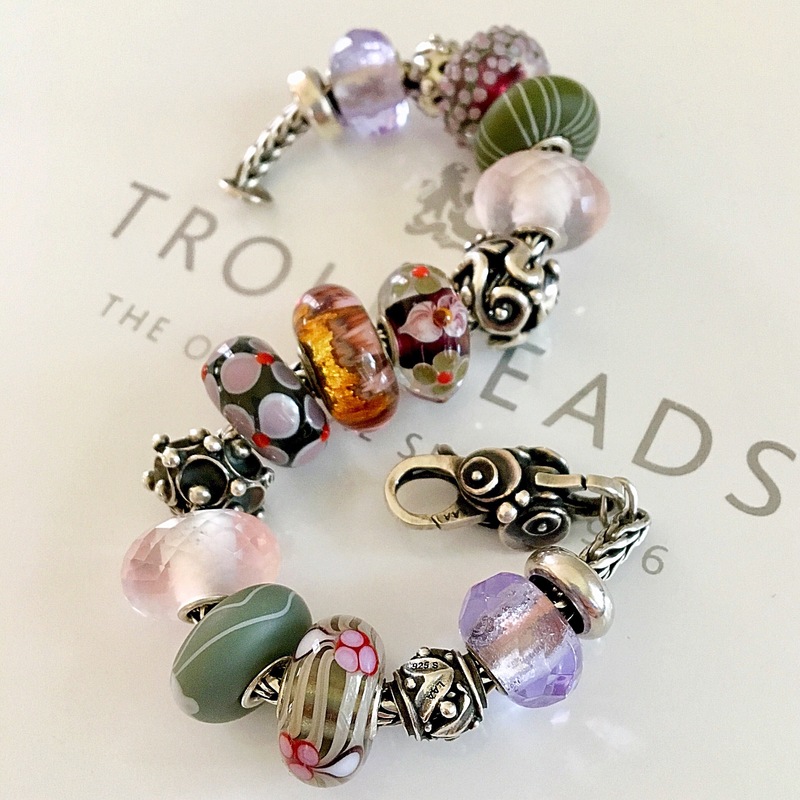 I don’t have any Trollbeads bangles-just bracelets. That might have to change. I can’t even imagine what it would be like to live within driving distance! I agree that their online photos are like shopping in person. I bought a few beads previously and thought when they arrived they looked exactly like they did online, which is not always the case. Have fun at the festival if you’re going this year! Carol, so glad you like these ones! I know we have a similar taste in beads so am not surprised you like them too. 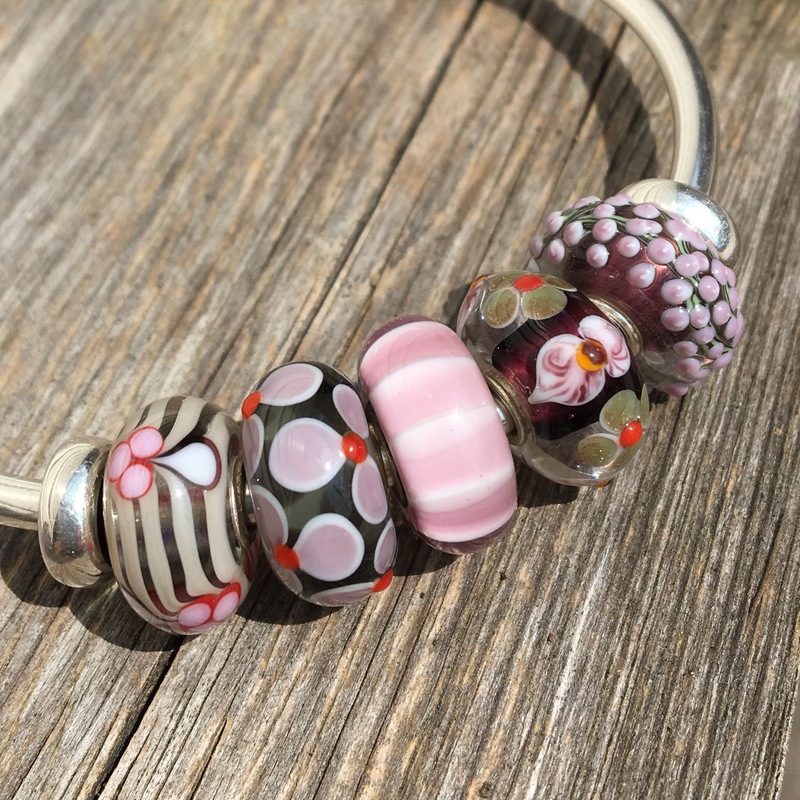 Beads with flowers and floral themes just make me feel happy! I am a huge fan of Blooming Boutique’s uniques! IMHO, they have the best selection of uniques that I have found. I check them often to see if there is something I have to have. They are always adding new designs. I love your unique choices Martha! I have had my eye on the bumpy purple wisteria unique for a while. I am pretty certain I need one now! 😉 I really like your last design with the Forest Life Kit. It is very eclectic and fun! I’m definitely inspired! Thanks!